If you happen to be someone who travels or commutes a lot, this gizmo might just become one of your favorites. 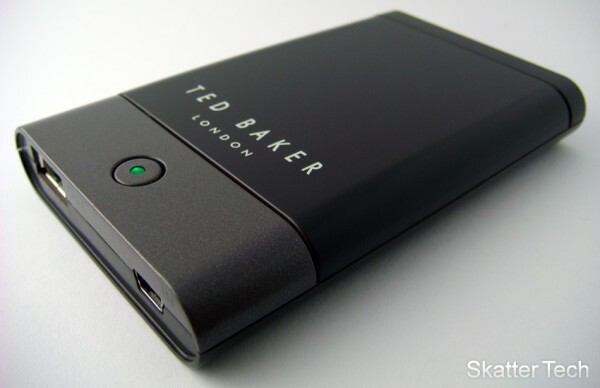 Proporta was kind enough to provide us with a demo unit of the Ted Baker Charging Kit, which includes a variety of components. 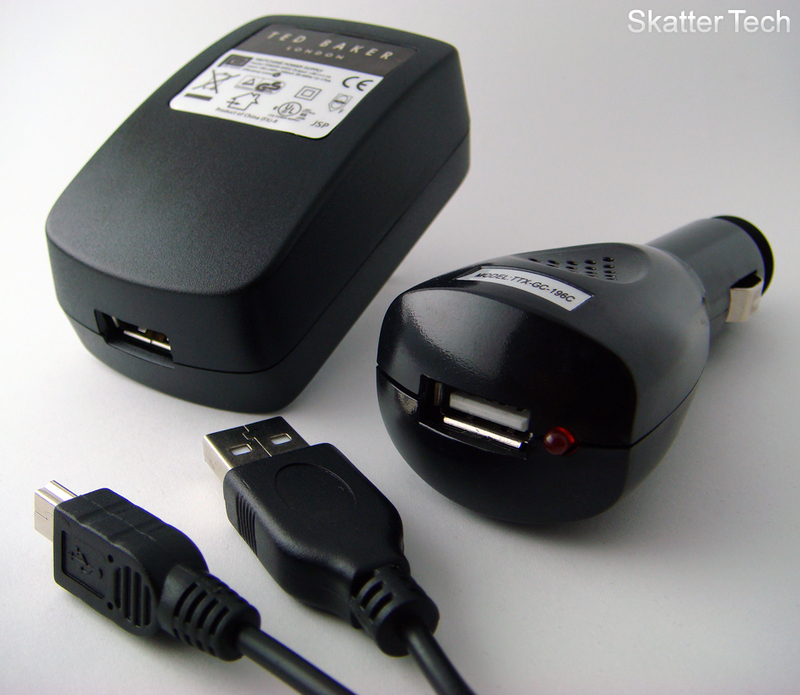 The entire set is centered around the battery pack, pictured above, which can be used to charge many different portable devices. Proporta provides plenty of methods to charge the battery pack and offers even more ways to disperse the energy to your portable gadgets. The Proporta Rechargeable Battery Back seems to be an excellent idea all around. The unit is fairly small (about the size of a iPod Classic), quite robust, lightweight (4.2 oz) and fairly good looking. There is only one button on the device which also contains an LED indicator inside. The indicator turns red while charging and goes green when complete. You’ll have to click the button to begin charging a connected device and the light remains green until it completes charging. The front side has a mini-USB input to charge the battery pack and a standard USB port to output power to your gadgets. The battery contained inside has 3400 mAH of storage and can output energy at 5v (700mA). I was able to fully recharge a completely depleted Creative Zen and a Apple iPod Nano without having to recharge. I was quite impressed to see that Proporta had provided many useful ways to recharge the Rechargeable Battery Pack. First method would be to use the included AC Adapter which has a USB port on the bottom. Just connect the battery to it using the included USB cable and it begins charging. Proporta provides pins for four major countries for the AC adapter, so you should be covered in some regard. 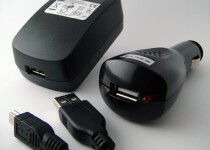 The second method to charge the battery would be to use the cigarette car charger. You’ll have to use that standard cable in this situation as well. And if you have not already guessed the third method, it would be to just plug that USB cable into a computer. Proporta outdid themselves in this category as well. I was able to charge just about every gadget I owned with this battery pack. For example I was able to use the USB cable that came with my iPod Nano to make the connection between the two. I used the included mini-USB cable to charge the Creative Zen and Motorola RAZR. I was also able to charge the LG Dare and LG Chocolate 3 (review units) with the USB cables that came with those phones. The best part about this being a USB interface might be the fact that when the device has received enough power, it sends a signal to the battery pack to shutdown, which saves battery for other devices. Proporta also includes a set of adapters for major brands of devices, these include: Nokia, Sony Ericsson, Apple iPod, Samsung, Mini USB, Micro USB, and a 4.0 DC. 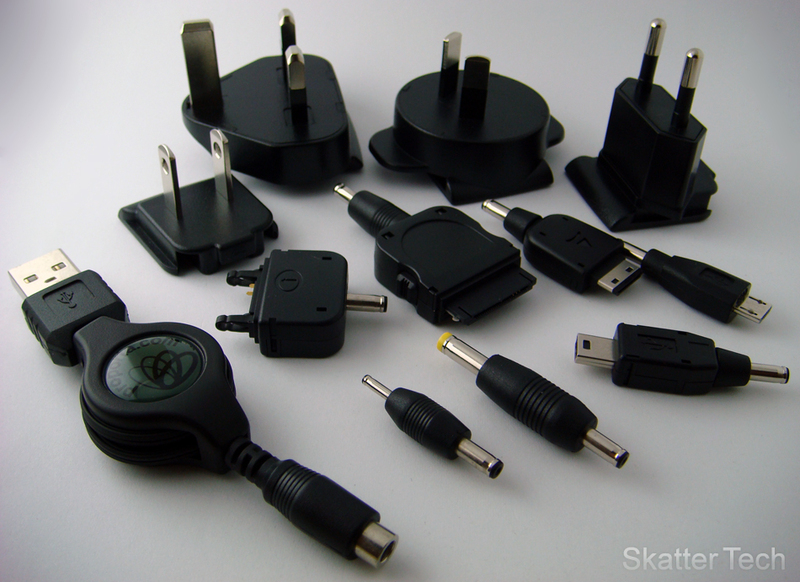 Proporta even sells additional adapters for other gadgets online, if needed. In my situation the included accessories for the battery was able to cover just about all the devices I had. In addition as a bonus, since one end of all the adapters is a USB head, you can charge any of the devices you would have been able to charging using the battery pack with either the AC Adapter or Car Charger. I would have to say that this is probably one of my favorite accessories I have used or reviewed. The entire product was well thought out and just works. It is quite practical and thanks to the widespread use of USB this has become possible. As long as the lifespan of the battery pack last at least a couple of years, this should be an excellent accessory for long trips or commutes. Proporta even includes a designer Ted Baker soft case to hold all the components of the kit together, so you’ll never have to worry about loosing them. I will definitely packing this with me on the next trip I take. 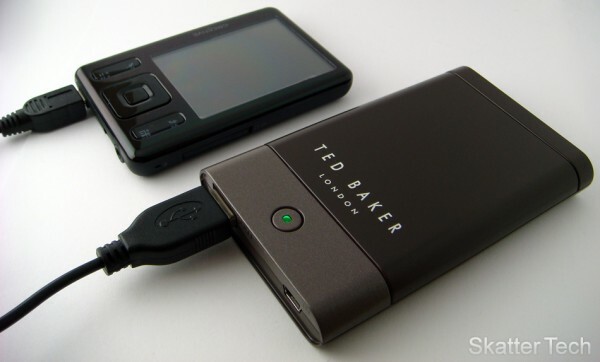 The Ted Baker Charging Kit is available for purchase on Proporta.com for $49, however since you are a Skatter Tech reader you are welcome to use the coupon code ‘skattertech’ (no quotes) to receive a 10% discount. this is exactly the type of thing i was looking for!!! thanks so much, 45 bucks isnt bad cuz they include all the othe pins and stuff. Apple is a freaking rippofff. their “world travel kits” costs 40$ and just has the pins. this one has the pins battery and stuff for just a bit more. i am ordering this as soon as i get my next paychck. also does thsi work with the psp? that would be cool. i have the new one btw. i am staying in Singapore, and like to check whether where can I purchase locally, instead of purchasing online as I do not have credit card. I managed to purchase online, and have received the package. I realized that there’s no userguides or manual for this. May I know what is the led button located at the center bottom for? It will show “green” and “red”. Glad you were able to figure out a way to buy one! So the button is the indicator which will turn red while charging and green when complete. When nothing is plugged in and it’s pressed it will be green to indicate that it has power. To charge a device plug it in and press the button. It will be green while it is providing a device with power. When the device is done charging the light turns off. hi where could i buy one from?